For most folks the last thing to come to mind when thinking about the Dodgers is pinstripes, but here we are. 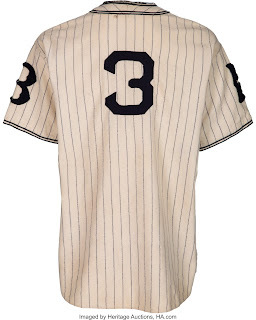 Featured is a vintage 1933 Brooklyn Dodger uni that is currently on auction at Heritage (Heritage auction link), and as you can see it comes with something associated more closely associated with the Yankees. For those who do not know, the Dodgers wore pinstripes at various times throughout their early history -- lastly in 1936. This jersey was worn by former Brooklyn first-sacker Joe Stripp, and it originally comes from his family. Stripp played in the New York borough for six seasons; slashing .295/.335/.384/.719 with 129 doubles, 13 homers and 284 runs batted in. His one claim to Dodger fame is that he was the very last batter and strike out victim of ex-Dodger and future Hall of Famer Burleigh Grimes. As you may know, Grimes was the very last pitcher legally allowed to throw the spit-ball. On another note, the auction listing states that this is the first time the "Dodgers" moniker has appeared on a team uniform. This is not entirely true. The club wore a similar uni as an alternate uniform the year prior. You can see evidence of this in the below graphic from Dressed to the Nines. 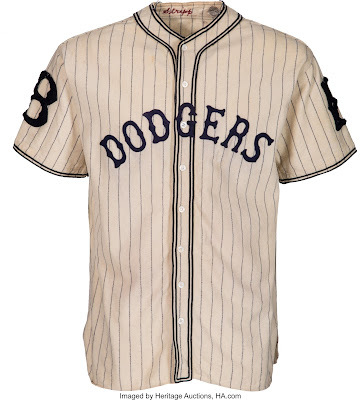 However, 1933 is the first time they had "Dodgers" on their uniform for an entire season. I have no idea what a jersey like this is worth in the collectors market, but I imagine something like this is very scarce and costly. Heck, there might be only a handful of these still in existence. Below are more photos of the full uniform to check out.